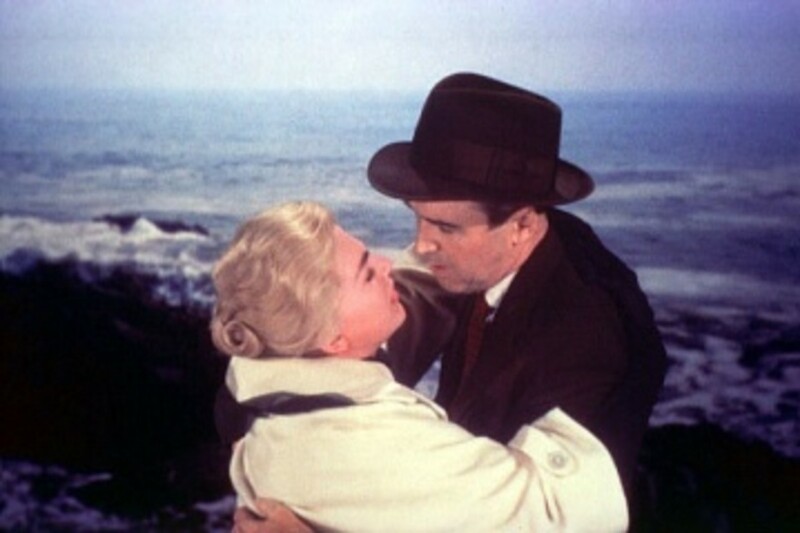 Alfred Hitchcock’s Vertigo portrays a man’s obsessive love for a woman and then for her ghost. Scottie Ferguson’s necrophilia drives him to reconstruct his love for Madeleine through Judy Barton (who was actually Madeleine’s impersonator). Ironically, Scottie desperately loves a woman who does not exist—the Madeleine he meets is an impostor. The real Madeleine Elster only appears in the film briefly, already a corpse. The fake Madeleine is created by men—first Gavin Elster, then Scottie Ferguson. While Elster reconstructs Judy in a plot to murder his wife, Scottie does it because of his necrophilic love for a ghost, a fantasy. In either case, the reconstruction of Madeleine reinforces the idea of female beauty as a male construct. Scottie reconstructs a woman to fit his idea of beauty and perfection—the problem is that this beauty is an illusion that will not hold up in reality. Indeed, after his release from the hospital, Scottie drifts through the city, imagining Madeleine at all the places she used to visit. As he looks in at the flower shop that she once frequented, she suddenly passes him on the sidewalk as Judy Barton. 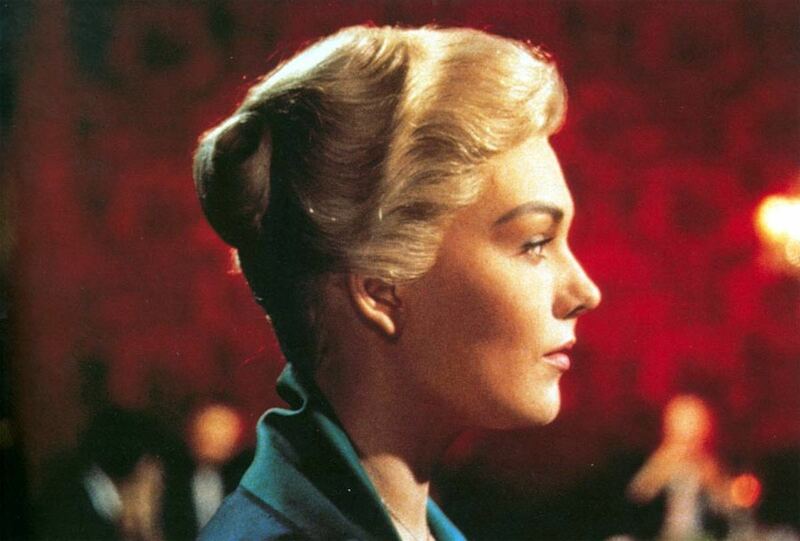 Judy is almost the complete opposite of Madeleine, the cool, sophisticated blonde in a grey dress suit. Judy is a “tawdry” brunette, wearing a green dress, lots of make-up, and big earrings. While Madeleine (supposedly possessed) wandered through the city alone, Judy walks with a group of friends, laughing and talking loudly. In everything but her appearance, Judy is nothing like Madeleine, but she stops right in front of Scottie in the recurring profile shot that Madeleine so often appeared in. Up to this point, the audience sees her as an ordinary shop clerk who shares an uncanny resemblance to Madeleine. She sympathizes with Scottie’s grief but understandably resents his “picking her up” because she looks like Madeleine. Until Judy’s written confession, the audience does not know that Judy is the woman that Scottie knew as Madeleine. Hitchcock reveals this plot twist midway through the film, not at the end as people would expect. Hitchcock explains why he made this change in the screenplay: “now we give the public the truth about the hoax so that our suspense will hinge around the question of how Stewart [Scottie] is going to react when he discovers that Judy and Madeleine are actually the same person” (Truffaut 244). 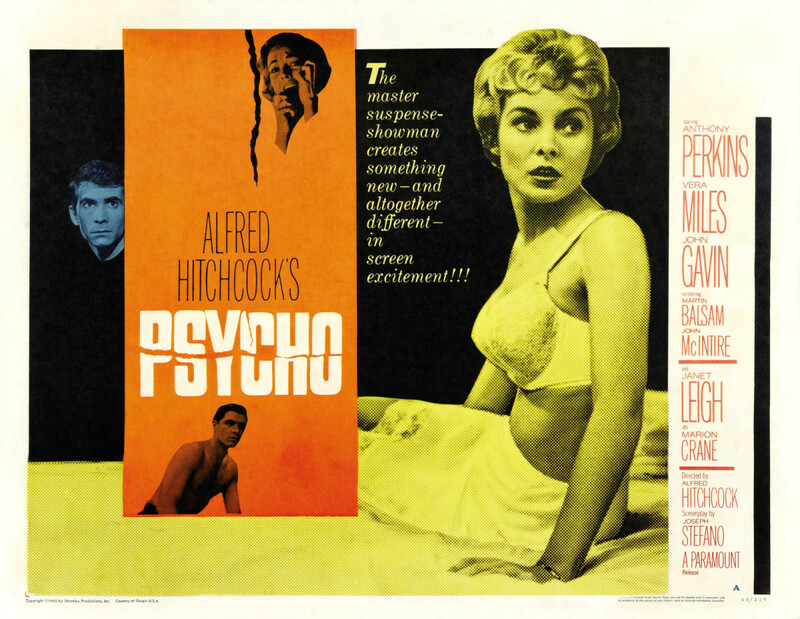 By dispensing with formula, Hitchcock “shifts the emphasis of the story from murder to character, a potentially deeper subject than the typical whodunit conundrum” (Locke). In her confession, Judy describes how Gavin Elster originally reconstructed her to be Madeleine: “He chose me to play the part because I looked like her. Dressed me up like her.” Presumably Elster coached her on how to become Madeleine—how to act, speak, and dress. 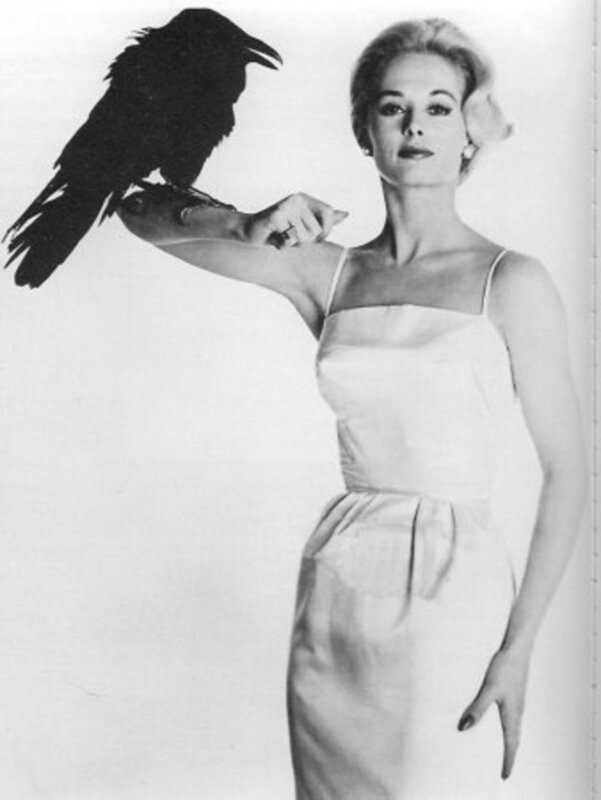 Judy was his mistress, but as his main objective was to murder his wife, Elster discarded Judy soon afterward. Soon the process of reconstruction will begin again, this time with Scottie trying to rebuild his dead Madeleine. This part of the film marks a shift in the focus, as Scottie replaces Madeleine’s mysterious behavior: "‘Madeleine’ was strange, Scottie was earthbound; now they switch. ‘Madeleine’ becomes the commonplace shop clerk, Judy, even reverting to unrefined speech; Scottie goes through a period of bizarre behavior, including complete mental withdrawal” (Locke). Hitchcock explains Scottie’s necrophilia, which in this sense does not mean a love of corpses. Instead, Scottie “wants to go to bed with a woman who’s dead; he is indulging in a form of necrophilia” (Truffaut 244). While Scottie originally tells Judy that he wants to see her just because he wants to get to know her, he is lying. He desperately wants her to become Madeleine. But Judy makes it clear that she wants to be Judy, not Madeleine. After deciding to go out with Scottie, she pushes Madeleine’s grey dress to the back of the closet and picks out a purple dress instead. When Scottie asks if he can keep seeing her she again asks why, “‘cause I remind you of her? Not very complimentary. And nothing else?” Scottie admits no. “Not very complimentary either,” she replies. She sits in her apartment in a green glow from the motel light outside her window. Scottie sees her in profile, and again he is struck by her resemblance to Madeleine—it is clear in his face and in the swell of the love theme. It makes him firm in his resolve; Scottie makes it clear that Judy has to become Madeleine. He will not touch her until she does. The couple walks side by side through a park, and Judy observes other lovers being affectionate. There is no such intimacy between Scottie and Judy. Scottie seems detached even as they slow dance at a party. Judy starts to protest when Scottie tries to buy her a grey suit like Madeleine’s. She says, “You want me to be dressed like her.” Scottie replies, “Judy, it can’t make that much difference to you…Do this for me.” Judy becomes more agitated and unhappy as this reconstruction picks up speed. For the third time, Judy says that Scottie is interested in her “‘cause I remind you of her. And not even that very much.” Scottie tries to comfort her, putting his hand on her face: “No, no, Judy, it’s you too. There’s something in you that…” He pulls his hand away and looks away. Scottie insists that yes, he wants to touch her, but his actions speak otherwise. He will not look at her or touch her because she insists on being Judy, not his fantasy Madeleine. Judy is desperate for Scottie to love her, saying, “Couldn’t you like me, just me the way I am?” However, that is impossible for Scottie, who then asks her to dye her hair blonde like Madeleine’s. “It can’t matter to you,” he says. Scottie said the same thing when he bought her the grey dress. What he is really saying to Judy is quite clear, that it should not matter to her what she looks like, only what she looks like to him. Because Judy is willing to do anything for his love, she finally gives in, and the reconstruction truly begins. Judy’s motivations for agreeing to be redone as Madeleine are complex. She realizes that for Scottie to love her, she will have to become Madeleine. However, if she truly becomes Madeleine again, Scottie may discover her secret. 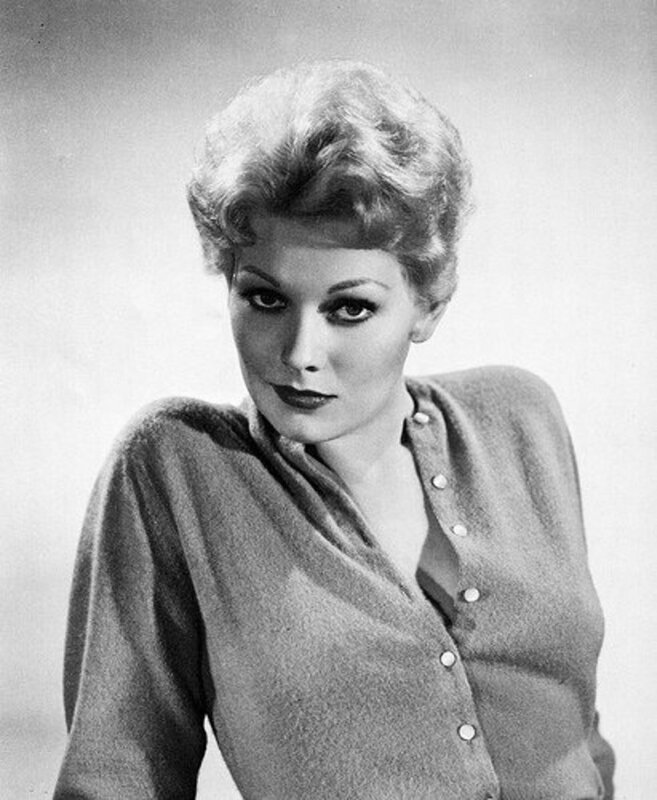 The shooting script of the film describes how on Scottie and Judy’s first date, when Scottie stares at the Madeleine lookalike, it is “‘[Judy’s] first defeat, and her first victory: defeat, in that although he is with her he is still searching; victory, in that she is sure, now, that he does not think she is Madeleine’” (Barr 70). However, until Judy agrees to enter Scottie’s fantasy (and at the same time, depart from reality in an illusion), she will be rejected, just like Midge. As Judy is being redone to look like Madeleine, the camera focuses on parts of her body—her eyes, lips, hair, hands. 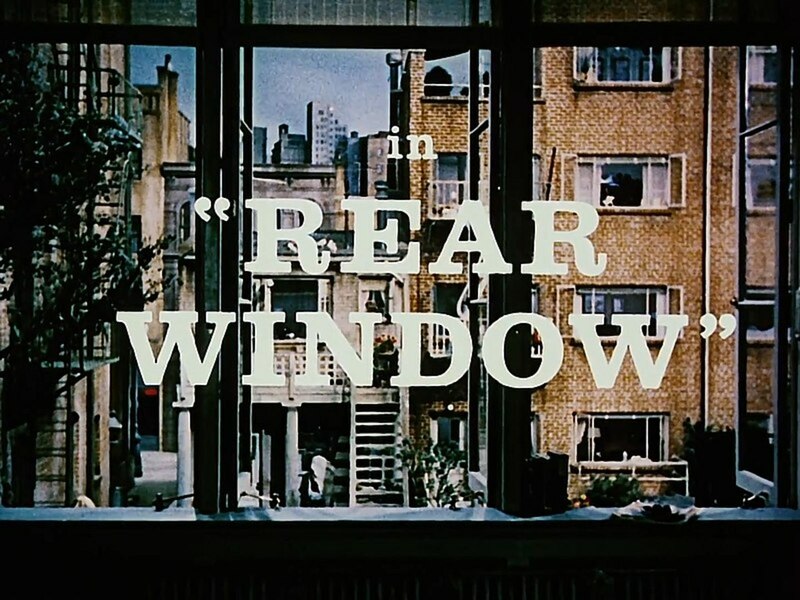 This tactic also appeared in the opening credits of the film, as “the camera moves across the face of an unidentified woman. After first framing the mouth, it moves up to a close-up of the right eye, which opens wide, as if in shock; then moves further in, as if into its interior depths” (Barr 15). 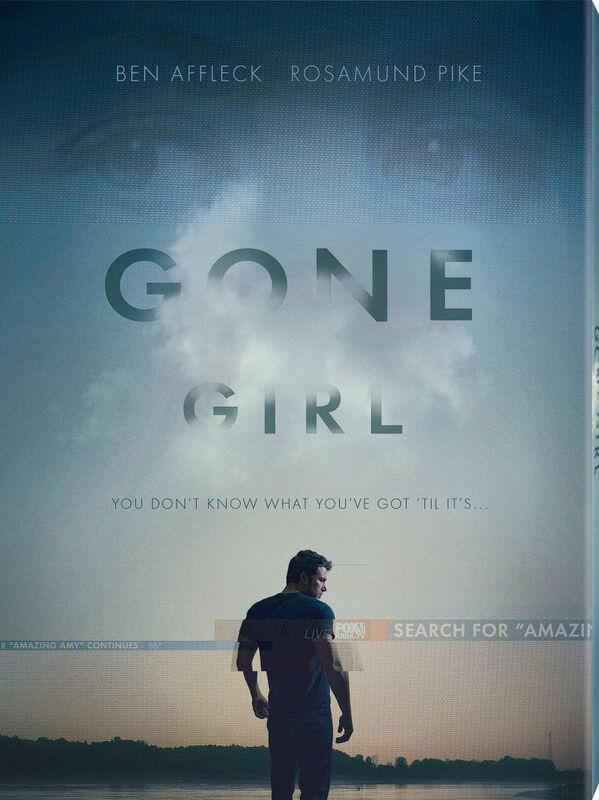 In both instances, the viewer is shown a woman broken up into parts, not whole. Female beauty becomes about the individual parts of the woman, not the complete woman, as if to change the eyes or the hair changes the woman. For Judy, the closer she comes to looking completely like Madeleine, the closer she comes to being completely “stripped” before Scottie, and possibly discovered as the actual Madeleine. Judy’s second transformation into Madeleine is a “breathtaking moment of romantic fantasy fulfillment; Scottie feels he has succeeded in defying death, in bringing Eurydice back from Hades; Judy hopes to finally regain his lasting love” (Berman). With the “Vertigo kiss,” Scottie is transported back to the mission where he first lost Madeleine; this time, the reborn Madeleine does not pull away from his kiss, and they will consummate the relationship. However, the audience must wonder how long the illusion will last, as “the illusory brittle fictitiousness of this moment makes it uncanny, scary and ominous” (Berman). The greenish glow coming from the window, the swelling music that evokes a carousel, the camera’s spin around the kissers all add to the sense of vertigo and overwhelming dizziness. Scottie’s motivations for reconstructing Madeleine are also complex and raise certain questions. Is Scottie “infatuated with the appearance of women but blind to substance? Or does he seek the unattainable in order to perpetuate desire?” (Locke). In any case, he obsesses over a fantasy, but how long can that fantasy last? If the fantasy becomes his reality, will he lose interest? For some critics, Scottie’s attempt to recreate Madeleine proves “that Scottie is mentally deranged, addicted to necrophilia, adamantly rejecting reality in favor of his morbid ideal” (Poznar 59). However, Walter Poznar argues that the opposite interpretation may also be true, “that Scottie knows Judy can become Madeleine, that what is most beautiful in her can only be realized if she has the courage to accept the potential Madeleine in her” (59). Recall the scene described earlier, in which Scottie tells Judy that “it’s you too. There’s something in you.” He hungers for the Madeleine within Judy, what she can become completely. When Scottie sees the necklace and realizes that he has been betrayed, “he experiences the revulsion and anger that follow inevitably from the realization that the woman before him has betrayed not only himself, his love and his hunger, but also the Madeleine in herself” (Poznar 60). The Orpheus and Eurydice parallel appears again as Judy absentmindedly wears Carlotta’s necklace and Scottie notices it—it is “Orpheus’s forbidden look which will send Eurydice back to hell” (Berman). After Madeleine’s figurative death in Scottie’s mind, Judy’s actual death occurs in the same manner, by falling off the same church tower. The fantasy is shattered when Scottie discovers Madeleine’s betrayal. Their love is doomed because it is built on an illusion, and a flimsy one at that. Scottie sets himself up for this betrayal and tragedy because of his inability to accept reality and to find love from willing women right in front of him. Instead, he recreates his phantom lover, a woman who was never real to begin with. Judy reluctantly lets him reconstruct her as Madeleine because it is the only way she can gain his love (however briefly). She is remade as Madeleine Elster twice, by Gavin Elster and Scottie Ferguson. They construct her in their image of beauty, but she ultimately remains only a ghost of beauty, a fleeting illusion. Barr, Charles. Vertigo. London: British Film Institute, 2002. Berman, Emanuel. “Hitchcock’s Vertigo: The Collapse of a Rescue Fantasy.” The International Journal of Psychoanalysis. 9 Oct. 2007. <http://www.psychoanalysis.org.uk/epff3/berman.htm>. Hitchcock, Alfred, dir. Vertigo. Perf. James Stewart and Kim Novak. 1958. DVD. Universal 1998. Locke, John. "Last Laugh: Was Hitchcock's Masterpiece a Private Joke?" Bright Lights Film Journal. 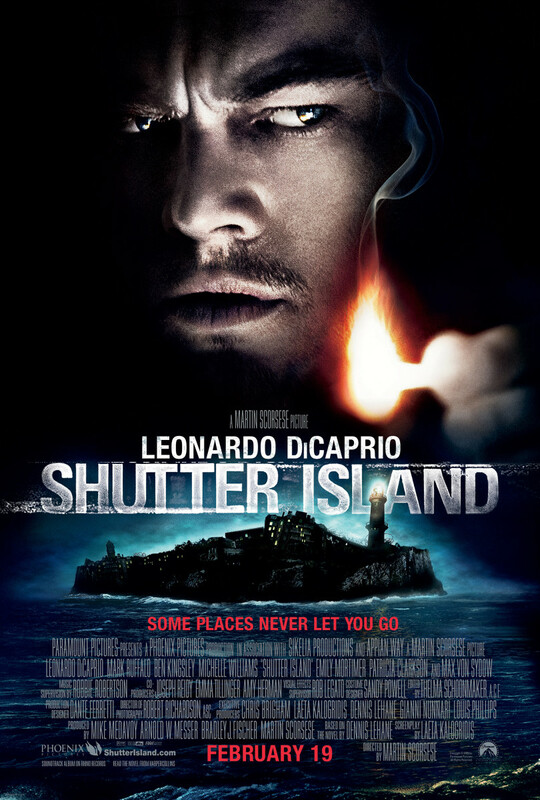 9 Oct. 2007 <http://www.brightlightsfilm.com/18/18_vertigo.html>. Poznar, Walter. “Orpheus Descending: Love in Vertigo.” Literature Film Quarterly 1989: 17. MLA International Bibliography. EBSCO. Sturgis Lib. Electronic Resources. 9 Oct. 2007 <http:// search.ebscohost.com>. Truffaut, François. Hitchcock/Truffaut. New York: Simon & Schuster, 1983. I still like imagining another twist ... Scotty tries to reconstruct the ghost and the ghost actually IS ALIVE inside Judy haunting her and trying to lure Scotty to his death to be with her. She jumps off the tower at the end and then he probably jumps too so he can finally be with her. Scotty says, "Just one more thing to do." Romeo and Juliet. What if Scottie actually believes that Judy is the ghost and any physical changes (hair color etc.) couldn't matter to her? He says that the necklace is sentimental to her (the ghost) near the end. What if she actually is a ghost and she jumps because she can only be with Scottie when they are dead together. If so, I think he jumps too just after the movie ends. What if Scottie took Judy up the tower so they could die together? Kind of a Romeo and Juliet thing. Scottie said he only had "one more thing to do." And he wasn't scared of the tower's height anymore because maybe he planned to die anyway. It's interesting that, eventually, they both say it's too late and there's only one more thing to do. It seems to me that Hitchcock might have thought of this twist as well which would take the movie beyond the current explanation and back into the supernatural for another twist. Maybe Scottie jumped and the ghost led him there. Before the fake suicide, what if Scottie's lover says it wasn't supposed to happen like this because she isn't Judy, she's the ghost saying I wasn't supposed to fall in love with you? While the whole life insurance/murder scam happened, maybe it was simply incidental to the ghost falling in love with Scottie. There is a Twilight Zone episode about a woman ghost leading the main character to his death. Maybe it was inspired by this movie. 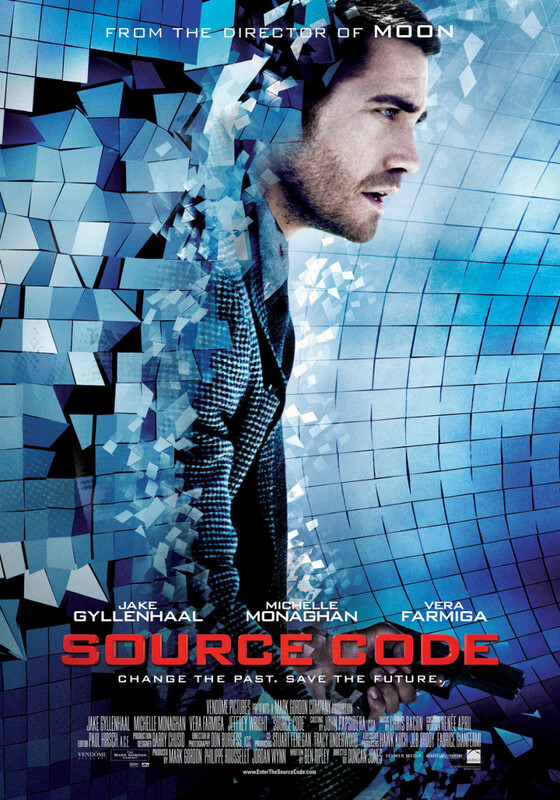 Very good analysis; this movie is my postgra. thesis, your write helped me a lot. Thanks for reading and linking, Cogerson! I need to check out your Hitchcock hub! I appreciate the comments, YankeesRule, Jamie, and Steven. Vertigo has become probably my favorite Hitchcock film; it's always been so haunting and chilling. Very nice article on Vertigo, lots of information that I did not know. Excellent hub....you have written a great detailed hub that is both interesting and informative......I am going to link this to my Alfred Hitchcock hub.....great job ....voted up and useful. Thanks, Genna! I love Hitchcock, and "Vertigo" is one of my favorites. Superb hub on this classic! Very well done. Thanks for reading, debussyfields. I appreciate your comments. 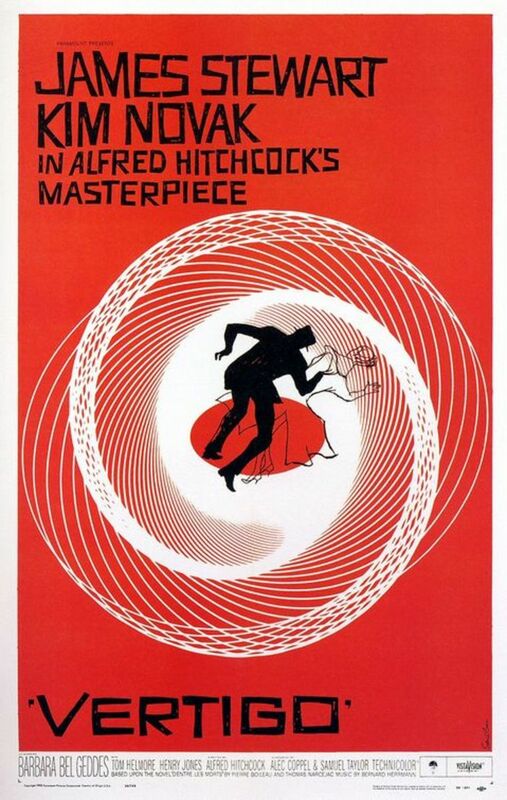 "Vertigo" certainly affects me on an emotional level, but I suppose years of English and some film classes have ingrained in me a need to analyze! Thank you for sharing your thoughts, feelings, and analysis. Obviously, this film means very much to you. I feel the same way. But, here and on IMDB, where I appreciated your post, too, I think that the important thing about this film is experienced on an emotional level. The brain, a fine instrument if there ever was one, seems to miss the point that the heart is trying to make.